The ridesharing company arrived on Martha’s Vineyard on Memorial Day weekend, to the consternation of taxi drivers. The arrival of Uber on Martha’s Vineyard over Memorial Day weekend ignited a barrage of criticism from taxi company owners, and spurred town officials to look for ways to regulate the ride-sharing service in the same manner as taxis. At the same time, riders say the service is a welcome alternative to the established order, and Uber drivers welcome the flexibility that comes with the on-call nature of the job. Uber attracts freelance drivers with promises of a flexible work schedule, and, according to classified ads, the ability to earn up to $1,500 a week. The company, now valued at more than $50 billion, according to recent published reports by Forbes and Bloomberg News, has exploded with popularity in its young life. Uber operates through a smartphone app and doesn’t have any known office or phone number on the Vineyard, but relies upon the drivers it recruits in the areas where it offers its services. A would-be driver needs only to visit the company website. The prospective driver is asked to provide a Social Security number for a background check, and then must upload scanned copies of his or her driver’s license, proof of insurance, and car registration. Applicants are then prompted to download the app and watch an introductory video. As far as The Times could learn by visiting the website, the hiring process for Uber is removed from personal interaction, as are its customer service and employee relations, which all operate through various email channels. Applicants receive text-message updates about the status of their applications from various phone numbers. During a test-run application by The Times, a text message was received from a Boston-area number. A call to that number yielded a robotic message: “Uber is not accepting phone calls at this time.” The call then ended. Training comes in the form of a 16-minute video at the end of the application process. “At Uber, drivers are our most important partners,” said a melodious male voice. Instructions for using the app, accepting rides, and being rated positively by riders followed. The video said that drivers and riders are matched by proximity. If a driver is notified of a ride request, he or she is the closest to the customer. “There is no driver on the road in a better position to accept the request,” said the narrator. An animated phone in the video beeps and flashes, and shows that the driver has a one-minute window to accept the ride. The video tells drivers to wait a few minutes upon arrival at the pickup location before contacting the rider through text message or phone call. Repeatedly, the narrator warns drivers not to pester riders who might not be ready to travel yet. Drivers are instructed to confirm the rider’s name once he or she enters the car, lest it be an imposter. The video further says that to accept riders who haven’t requested a ride through the app is illegal, and could result in fines. The crux of maintaining employment, and according to a ruling by the California Labor Commission last month, drivers are employees, is maintaining a positive customer rating. Ratings are denoted in stars. After each ride, the app prompts customers to rate the ride and driver. The instructional video reveals that drivers also rate riders. Lauren Altmin, an Uber spokesperson, explained in an email that a similar standard is applied to riders. “If a rider regularly exhibits disrespectful, threatening, or unsafe behavior, they may no longer be able to use the service,” Ms. Altmin said. Ms. Altmin did not respond to whether a rider has ever been banned from using Uber, or whether such ratings have been used in any legal capacity. A rider cannot see his or her rating, or any comments which accompany it. “They just approve you, there’s no interview,” said a Boston University student and driver from Chilmark who spoke to The Times on the condition of anonymity, to prevent possible repercussions. The driver said he has worked for Uber in Boston since September, and praised the flexibility it provides for a college student’s schedule. Uber raises its price by varied percentages in areas where demand for rides exceeds available drivers. The company calls this practice surge pricing. “In Boston it’s always surging somewhere. If it’s not surging in Boston, it’s surging in Cambridge … Here, the zone is the whole Island. It wouldn’t be surging in Edgartown and not up-Island,” said the Chilmark driver. He explained that the Cape and Islands are divided into zones. The Cape has two, and both Martha’s Vineyard and Nantucket constitute individual zones. “I’ve seen it at 1.5 [150 percent surge], but I’ve never actually gotten a surge fare. But once it’s July, I assume it’s going to surge ridiculous amounts, because there’re not enough drivers to fill that gap, and that’s why it surges,” he said. The orientation video says surge pricing is most likely to take place during peak driving times, like rush hour, bad weather, or holidays. Sports games and concerts can also cause prices to spike. Drivers are made aware of where the surge areas are, and rides picked up in surge areas will be charged the additional fare. Riders can see that the fare they agree to will be subject to surge rates, but cannot see where the zones are divided. At around 9 pm on the Fourth of July, prices in downtown Edgartown surged 3.4 times. A ride to Hostelling International Martha’s Vineyard, just past the airport, was estimated to cost $66-86. During regular-fare hours, that same ride costs just over $20. A taxi ride for the same trip was $27 that evening. 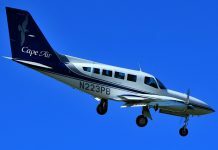 A Times reporter recently traveled midweek by taxi from Edgartown to a meeting held in the conference room of the Vineyard Transit Authority in the Martha’s Vineyard Airport Business park. The return trip to Edgartown was with Uber. Finding a taxi in Edgartown proved an easy task downtown at a taxi stand across from the Atlantic restaurant. Jon’s Taxi driver Riccie Tucker sat in the passenger seat of her van with all her doors open. “Need an Island tour?” she asked, as she leaned out of the vehicle in the sunny early afternoon. Jon’s Taxi Service, she later explained, offers extensive Island tours on top of typical taxi rides. “You can sit right in the front,” she said as she closed all the doors. Ms. Tucker apologized for her air conditioner, which was not working, and chatted with the front windows rolled down through most of the ride to the business park. “I”m enjoying this breeze,” she said. The van was clean, if slightly cluttered. A pocketbook sat in a heap between the front two seats. Ms. Tucker made conversation for much of the ride, largely about the weather and how she would not be looking forward to another presidential vacation on the Island. The ride totaled $25 dollars without a tip. Ms. Tucker said she could only process cash. After being handed two $20 bills, she said she was unsure if she could make change. “Everyone always tells me to keep the change,” she said. Ms. Tucker was handed a $4 tip. 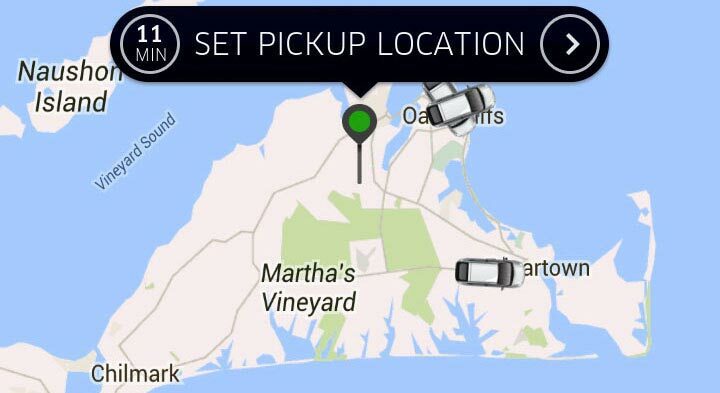 When it came time to return to Edgartown, The Times opened up the Uber app, which displayed the location where the ride request was originating from. For about 10 minutes, the app message stated there were no available drivers. When a driver did accept the ride, he was shown to be 15 minutes away, near Menemsha. After a few minutes, the application stopped providing an update of the driver’s location. The app returned to the opening screen, and an e-mail message said the minimum fare would be charged, $6, for a ride that appeared to have been canceled without any notice. Uber does not use cash, and all transactions are automatically charged to the user’s debit or credit card. The screen once again stated no more drivers were available. A few moments later, a driver named Steven accepted the ride. The app showed he was down the road at the airport. He arrived at the business park in moments. Steven drove a white SUV. He said he had just dropped off a customer at the airport, which was when he became available. “This is only my second day on the job,” he said. Steven said he first used the Uber service in Arizona, where he lives in the winter, and that Uber provided the flexible hours he needed in order to be employed for the few months that he is not on the Island, where he does lawncare. Steven said he was aware of the controversy among Uber and taxi companies. Steven said Uber was an indication of progress. Steven said he had not heard about the expanded taxi regulations in Edgartown, which now include transportation network companies (TNCs) like Uber. Like the Chilmark driver, Steven said he wouldn’t be worried until Uber notifies him. “I don’t know how they’re going to ever monitor that,” he said. Steven said that because TNCs are so convenient, he thinks there will come a time when regular taxi services no longer exist. “It’s good for the people,” he said. The cost of the ride was $15.86. UberX does not include compulsory tipping, and a driver rating ended the transaction. Correction: An earlier version of this story incorrectly reported Uber’s valuation at $18 billion. Most recent reports place the company’s valuation at $50 billion.